As an Ayurvedic herb, amalaki is said to expel excess heat from the body. Amalaki also acts as a natural anti-inflammatory that soothes the digestive tract. It gently detoxifies the body and supports healthy, regular elimination. Freshly Ground Emblica Officinalis (Amalaki Fruit), Pullulan Capsules (Aureobasidium pullulans). 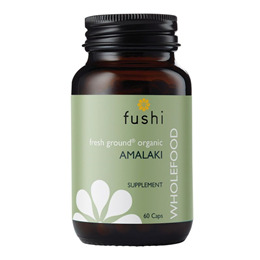 Below are reviews of Fushi Organic Amalaki - 60 Vegicaps by bodykind customers. If you have tried this product we'd love to hear what you think so please leave a review.